Cat People - Who needs flying squirrels when you can see creatures like this? Magic Mop - I guess that magical girls have some pretty strange weapons. 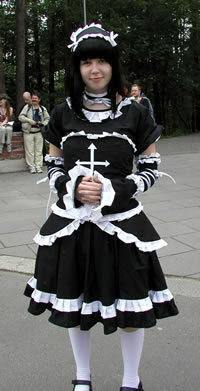 Not Quite Chaos - Of course I don't know the costume, but shouldn't there be eight arrows on that religious symbol? 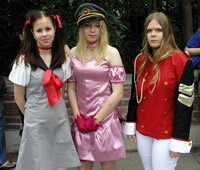 Military Chic - Are these girls anime fans or refugees from Sergeant Pepper? 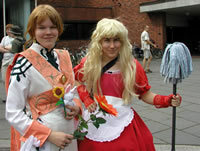 Made Up - Not only were some of the costumes really high quality, there were some fabulous make-up jobs as well. Finn Moment! 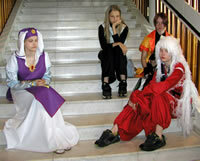 It is hard to separate the Finns from their mobile phones, even when they are supposed to be elegant Japanese princesses. 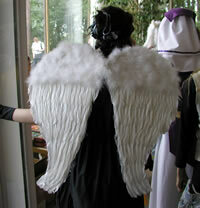 Wings - Not mechanical, but some nice feathers. So Bored - Teenagers are the same the world over.